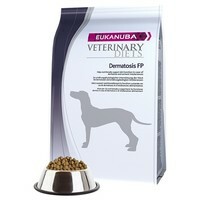 Eukanuba Veterinary Diets Dermatosis Dog Food has been carefully formulated to help nutritionally support skin function in cases of dermatosis and nutrient intolerances. Made with a selected protein and carbohydrate source of fish and potato to help avoid ingredient intolerance and/or allergy, Eukanuba Dermatosis FP also contains an adjusted ratio of Omega Fatty Acids to help soothe skin irritations, support normal skin barrier functions, and maintain a glossy coat. Suggested by Vet to cure scaly skin in our rescue greyhound. Has improved his coat condition no end and now it gleams in the sun and the skin is no longer scaly.